Get Your Gloves & Grabbers: Spring Watershed Cleanups Are Right Around the Corner! Our first season of volunteer cleanups with local apparel company United By Blue was a huge success, and we’re excited to start another round this spring. In 2016, nearly 1,000 volunteers joined PWD , United By Blue, Philadelphia Parks and Recreation and other partners at 15 clean ups to remove nearly 33 tons of trash from waterfront green spaces like Bartram’s Garden and Penn Treaty Park. 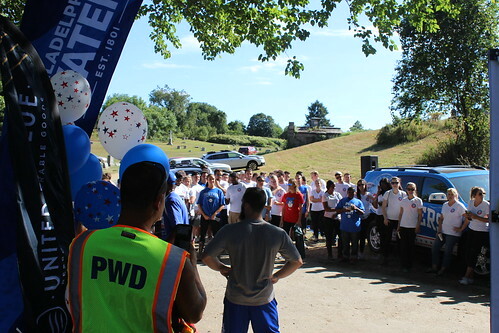 Over 100 volunteers from the Philadelphia 76ers, Tilden Middle School and Friends of Mount Moriah Cemetery joined Philadelphia Water and Untied By Blue for a Sept. 16 cleanup targeting Cobbs Creek and the surrounding woods. The cleanup was the latest in a series of volunteer events that kicked off this spring and have seen hundreds and hundreds of residents taking on trash in and along local waterways.